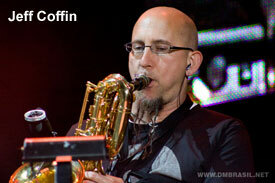 Clinic Synopsis: Frank Alkyer hosts Jeff Coffin for an in-depth interview about jazz music and jazz education. Clinician Biographical Information Jeff Coffin is an American jazz and alternative rock musician best known as the saxophonist for the Dave Matthews Band and Béla Fleck and the Flecktones. In addition to the saxophone, he plays clarinet, flute and oboe. He also provides exciting jazz clinics to students in junior high school, high school, and college jazz programs worldwide.